Shark Tank, Mazatlán Style | ¡VidaMaz! The aquarium is open again! Today a video purporting to be created by employees of the Aquarium is circulating on social media. It says that the Aquarium’s new director ordered employees to enter the tank and remove a yellow covering from the window shown above. As you can see in the photo, no yellow covering seems apparent. According to the video, the Aquarium personnel are not qualified to make any repairs or changes to the tank. Sadly, one erroneous hit with a tool, just as the workers finished, caused a crack in the acrylic. The video includes photos. It is hard to know, of course, what actually happened. To me this is hopeful, as it would mean the basic structure of the tank may be sound and the acrylic just needs replacing. Hopefully all will be sorted out soon. The curved acrylic wall of the new shark tank, pictured above, cracked open yesterday afternoon about 6pm, just one and a half months after its inauguration. It was what so many had feared, given the storied history of the building of the tank and the final heated push to get it open before the change in city and state administrations. The rupture caused nearly two million liters of salt water to flood the surrounding area. Fortunately the fissure occurred after closing time, so no visitors were in the facility and staff were quickly evacuated. The Aquarium will be closed while a safety assessment is conducted and repairs are done. It has been reported that the 20 sharks and other sea animals are unharmed and will today be transferred to another tank. Mayor Pucheta promises legal action against those responsible for the shoddy design, labor or materials. Such a sad new chapter in this lengthy and expensive saga, and just before Carnavál. Mazatlán’s long-awaited 2.5 million liter (660.5 thousand gallon) shark tank, which opened on December 23, includes one of those cool acrylic tubes you walk through to be completely surrounded by fish. The light in the kids’ eyes as they realize they are in the middle of a tank with 23 sharks is most definitely delightful. Acuario de Mazatlán’s new Tiburonario was built at a cost of 80 million pesos over six years, two governors, three mayors and four aquarium directors; construction was far from the height of efficiency (final costs were 5x more than originally forecast), but unlike other projects, in the end this one delivered to us a first-rate attraction that will generate revenue and jobs for the city for years to come. The aquarium had 435,000 visitors in 2016—a 41% increase since 2013, and in early January when I visited the lines to enter snaked around the block and seating for shows was completely full. Last year the facility took in 20 million more pesos than in any prior year, and I have no doubt the new shark tank will add to that popularity. Click on any photo to enlarge it or view a slideshow. I had the pleasure of spending the afternoon with the aquarium’s Director, Milay Quintero Beltrán, just days after she was sworn in to her new position. I was impressed with the knowledge she demonstrated with only four days on the job! Lic. Quintero is a public accountant and holds a master’s in human resources. Brenda García, the Director of Marketing, joined us on my visit. They both were charming, hospitable and extremely enthusiastic about the aquarium, and made sure I was hugged and kissed by a sea lion in a private show. I was guided through the rescue facility, including the veterinary clinic and the temperature-controlled building where the sea turtle eggs are hatched. A kiss from a sea lion was great fun! I had not visited the aquarium in a few years, remembering it as tired and outdated. Its recent major remodeling, which is nearly complete, is the first in 36 years and one well worth checking out. More modern architecture and new acrylic murals jazz up the space, and plans include a new restaurant beside the shark tank; more fish, additional decorations and finishing to the shark tank itself; overall remodeling and updating with a consistent tropical theme; and the addition of habitats for both penguins and dolphins! If, like me, you wonder why those tinacos/water tanks right in front are such an eyesore, Milay assured me they will be covered up shortly. The Acuario de Mazatlán opened in September of 1980 as part of the Bosque de la Ciudad (city park) project. The one-hectare site includes 34 salt water and 17 fresh water exhibition tanks, a botanic garden with 75 kinds of trees from around the world, three aviaries, and Latin America’s only frog habitat. It has partnership agreements with both the Monterey Bay Aquarium in California and the Acuario de Veracruz. Mazatlán’s aquarium is administered by DIF (Family Development Department), SEMARNAT (Secretary of the Environment) and PROFECA (Environmental Protection). Its goals include education and rehabilitation. The aquarium regularly hosts school groups and collaborates with the Mexican Academy of Sciences to host “Science Saturdays” for local youth interested in science and technology. The on-site clinic has four veterinary staff who most commonly aid pelicans and sea turtles, but have been known to treat tigers, raccoons and all sorts of birds as well. The aquarium’s sea turtle rescue program has protected over 4,500 nests and released nearly 300,000 babies. The hatchery facility is made of paja, or straw and clay walls, to keep the eggs at a consistent temperature. The eggs are all in OXXO coolers, as the chain of supermarkets sponsors the turtle rescue program. Did you know the eggs must be gathered from the beach within four hours of being laid? They gestate for about 40 days, and then the babies are immediately released. Mazatlán’s aquarium will host turtle specialists from all over Mexico in a convention February 7-9. While sea turtle rescue is well known, you might not have heard about the aquarium’s Pato Pichichin program. The Pichichin ducks, who are in danger of extinction, reproduce on Bird Island, the northernmost island directly offshore—an environmentally protected area. 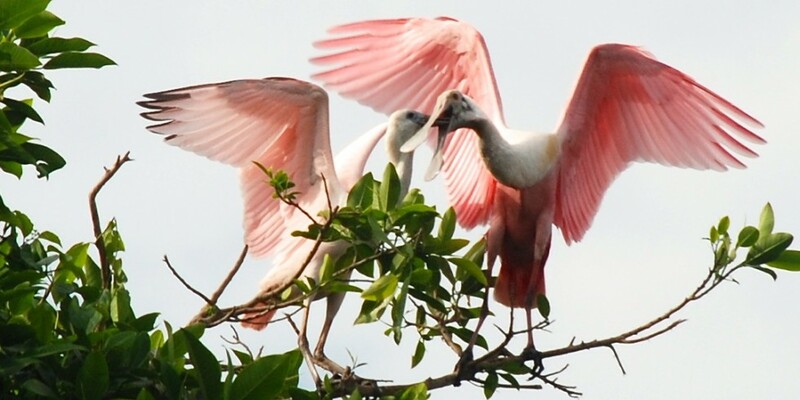 Young pichichines leave the nest to come to Mazatlán’s lagoons, and some become separated from the flock. The aquarium receives about 300 of these babies annually. Aquarium staff also aid about 72 pelicans every year, most of them injured by fishing nets. Any wildlife that recovers sufficiently and is able to fend for itself is returned to its natural habitat. The Acuario de Mazatlán is open 9 am to 5 pm every day of the week. You may, like me, be spoiled by having visited some of the world’s best aquariums. Mazatlán’s is much quainter in comparison. I went not expecting to enjoy myself, honestly, more out of curiosity, but I had a hoot of time! If you haven’t been, it’s well worth a visit. In addition to the fish tanks there are extensive displays of reptiles, birds and amphibians. Admission includes access to all the shows; the four half-hour espectáculos run back-to-back from 10:30 am to 1:30 pm and 3:40 to 5:00 pm, and include tropical birds, sea lions, animals of prey and divers feeding the fish. Most of the aquarium’s show performers are rescue animals who cannot be returned to the wild. Entry costs 115 pesos for adults and 85 pesos for children 3-11. Swimming with sharks or sea lions is an extra charge (300 and 400 pesos, respectively). The swimming still takes place in the aquarium’s original 123,000 liter main tank. Did you know that sea lions live in captivity up to 40 years, and eat up to 25 kg of food per day? Or that an owl can turn its neck 270 degrees, not 360? I know you’ll pick up some more fun facts on your next visit, and greatly enjoy yourself. If you’re lucky, you might just get a sea lion kiss, too. Below is the official video from the inauguration of the shark tank. Every time I’ve gone on vacation to Mazatlan, I have always wanted to stop at this aquarium. You took beautiful pictures! It is most definitely worth a visit. I had a ball! Thank you! Thanks Diane! I can’t wait to check it out! You’ll enjoy! Be sure to take in 1 or 2 of the shows. It’s fun to watch the kids’ awe! It has been sour for all of the six years of its construction. I see this as one more sad phase. Hopefully it’s salvageable. Shame on those who pocket public monies instead of using it for public good.